In Washington, DC, the person who oversees the administration of a decedent's estate is called a personal representative. Among a personal representative's duties may be selling a decedent's real property to pay the estate's debts or to equally divide proceeds among heirs. Use a personal representative's deed of sale to convey title to real property to a purchaser pursuant to the terms of a decedent's will or court order following petition. The deed conveys title with special warranty, covenanting that the personal representative has maintained the title in the same status as when the decedent died. 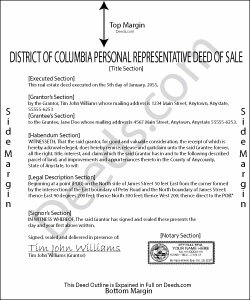 Consult an attorney with questions about using a personal representative's deed of sale, or any other issues related to probate in Washington, DC.